Over the last few years Herb Robert has spread across our garden, where it has become too invasive we rip it up and add it to the compost heap. For years I have known that it has medicinal benefits but it is only since starting this website that I have got around to finding out more about it. It is a member of the geranium family and the leaves, flowers and seed heads make it a very attractive plant. The seed heads look like a bird’s beak which is why it is often called cranes bill. The seeds are very robust and can last for up to six years in the soil which is probably why it has spread so well in our garden. The seed head can also “throw” it’s seeds for some distance and are a bit sticky so they can be spread by birds and animals. Herb Robert is described as “a supreme, therapeutic herb” and is said to enhance the immune system. Ground cover – Herb Robert spreads well even in shaded areas. 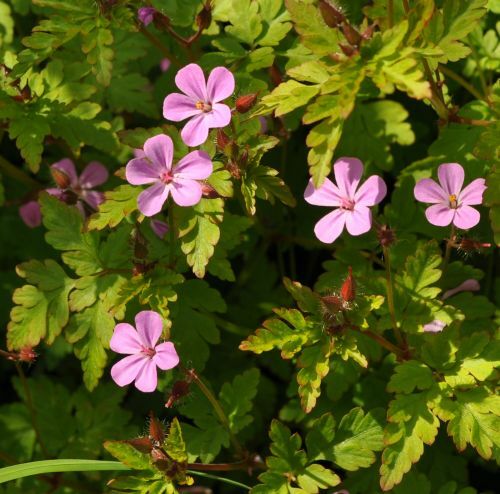 medicinal plant for animals – some people recommend making sure that Herb Robert is available for cattle and poultry to feed on, apparently many animals know which plants will do them good, unlike us these days!